El patrón es de la pagina: http://www.lionbrand.com/ Para ver este patrón o cualquier otro de los que tienen hay que registrarse antes, asi que lo he pegado aqui para todos a los que no les apetezca registrarse (cosa que aconsejo ya que la pagina esta llena de patrones gratis). Foundation Rnd: Sl st in 3rd ch from hook and next 3 ch, ch 2. Do not turn, working in free loops on opposite side of beginning ch, sc in first 4 ch, 3 sc in beg ch-2 sp; pivot to work in sl sts at beginning of rnd, sc in each of 4 sl sts, 3 sc in end ch-2 sp; do not join - 14 sc. Place a marker to indicate beg of rnd; move marker up as each rnd is completed. Rnd 1: Sc in next 4 sc, 2 sc in next sc, sc in next sc, 2 sc in next sc, sc in next 4 sc, 2 sc in next sc, sc in next sc, 2 sc in next sc - 18 sc. Rnd 2: Sc in next 3 sc, 2 sc in next sc, sc in next 3 sc, 2 sc in next sc, sc in next 4 sc, 2 sc in next sc, sc in next 3 sc, 2 sc in next sc, sc in next sc - 22 sc. Rnd 3: Sc in next 4 sc, 2 sc in next sc, sc in next 3 sc, 2 sc in next sc, sc in next 6 sc, 2 sc in next sc, sc in next 3 sc, 2 sc in next sc, sc in next 2 sc - 26 sc. *Rnds 4 and 5: Sc in each sc around. Rnd 6: (Sc in next 8 sc, sc2tog, sc in next sc, sc2tog) twice - 22 sc. Rnds 7 and 8: Sc in each sc around. Rnd 9: 2 sc in next sc, sc in next sc, 2 sc in next sc, sc in next 6 sc, (2 sc in next sc, sc in next sc) twice, 2 sc in next sc, sc in next 6 sc, 2 sc in next sc, sc in next sc - 28 sc. Rnds 10-12: Sc in each sc around. Rnd 13: Sc in next sc, 2 sc in next sc, sc in next 11 sc, 2 sc in next sc, sc in next sc, 2 sc in next sc, sc in next 11 sc, 2 sc in next sc - 32 sc. Rnds 14-17: Sc in each sc around. Rnd 18: (Sc in next 2 sc, sc2tog) 8 times - 24 sc. Rnd 19: (Sc in next sc, sc2tog) 8 times - 16 sc. Rnd 20: (Sc2tog) 8 times - 8 sc. Sl st in next sc. Fasten off, leaving a long tail. Weave tail through last rnd, gather tightly and fasten off. Note: Work begins at neck. With A, ch 3; join with sl st in first ch to form a ring. Rnd 1: Work 6 sc in ring; do not join. Place a marker to indicate beg of rnd; move marker up as each rnd is completed. Rnd 2: Work 2 sc in each sc around - 12 sc. Rnd 4: (Sc in next sc, 2 sc in next sc) around - 18 sc. Rnd 5: (Sc in next 2 sc, 2 sc in next sc) around - 24 sc. Rnd 6: Sc in each sc around. Rnd 7: (Sc in next 3 sc, 2 sc in next sc) around - 30 sc. Rnd 8: (Sc in next 4 sc, 2 sc in next sc) around - 36 sc. Next Rnd: (Sc in next sc, sc2tog) 12 times - 24 sc. Next Rnd: (Sc in next sc, sc2tog) 8 times - 16 sc. Next Rnd: (Sc in next 2 sc, sc2tog) 4 times - 12 sc. Last Rnd: (Sc in next 2 sc, sc2tog) 3 times - 9 sc. Rnd 1: Work 6 sc in ring; do not join. Place a marker to indicate beg of rnd; move marker as each rnd is completed. Rnd 3: (Sc in next sc, 2 sc in next sc) around - 18 sc. Rnds 4 and 5: Sc in each sc around. Rnd 6: (Sc in next sc, sc2tog) around - 12 sc. Rnds 7-13: Sc in each sc around. Note: Change to working back and forth in rows. Row 14: Ch 1, turn sc in first 6 sc; leave remaining sts unworked. Row 15: Ch 1, turn, sc in first 4 sc; leave last 2 sc unworked. Row 16: Ch 1, turn, sc in first 2 sc; leave last 2 sc unworked. Row 17: Ch 1, turn, sc in first 2 sc, sc in unworked sc in row below; leave 1 sc unworked - 3 sc. Row 18: Ch 1, turn, sc in first 3 sc, sc in unworked sc in row below; leave 1 sc unworked - 4 sc. Row 19: Ch 1, turn, sc in first 4 sc, sc in unworked sc in row below - 5 sc. Row 20: Ch 1, turn, sc in first 5 sc, sc in unworked sc in row below - 6 sc. Rnd 21: Ch 1, turn, sc in first 6 sc; insert hook in edge of work and draw up a loop, insert hook in unworked sc in row below and draw up a loop, yarn over and draw through all loops on hook (edge-sc2tog made); sc in next 4 sc; insert hook in next sc and draw up a loop, insert hook in edge of work and draw up a loop, yarn over and draw through all loops on hook (edge-sc2tog made); do not join - 12 sc. Note: Change to working in rnds. Rnds 22 and 23: Sc in each sc around. Rnd 24: (Sc in next sc, 2 sc in next sc) around - 18 sc. Rnd 25: Sc in each sc around. Rnd 26: (Sc in next 2 sc, 2 sc in next sc) around - 24 sc. Rnd 27: Sc in each sc around. Rnd 28: (Sc in next 3 sc, 2 sc in next sc) around - 30 sc. Rnd 29: Sc in each sc around. Rnd 30: (Sc in next 9 sc, 2 sc in next sc) 3 times - 33 sc. Rnds 31 and 32: Sc in each sc around. Rnd 33: (Sc in next 9 sc, sc2tog) 3 times - 30 sc. Rnd 34: (Sc in next 3 sc, sc2tog) around - 24 sc. Rnd 35: (Sc in next 2 sc, sc2tog) around - 18 sc. Rnd 36: (Sc in next sc, sc2tog) around - 12 sc. Rnd 37: (Sc2tog) 6 times - 6 sc. Work Rnds 1-6 as for Back Leg. Rep Rnd 7 until Leg measures 7 in. (18 cm). Fasten off. Rnd 1: Work 6 sc in ring; do not join. Place a marker to indicate beg of rnd; move marker as each rnd is completed. Rnd 2: 2 sc in each sc around - 12 sc. Rnds 3 and 4: Sc in each sc around. Fasten off leaving a long tail for sewing. Flatten Ear. Rnd 2: Sc in each sc around. Rep Rnd 2 until Tail measures 7 in. (18 cm). Fasten off. 1) Insert hook into Lion around a stitch. 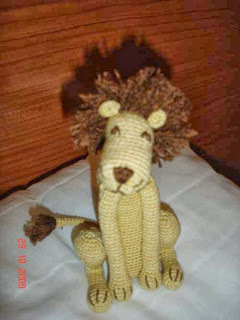 2) Yarn over with C.
3) Draw loop of C back through stitch of Lion. 4) Insert hook around next stitch of Lion. Rep from step 2, working Mane randomly around Head and shoulders of Lion. To finish, cut C leaving a 3 in. (7.5 cm) tail. Draw tail through last loop of C. Draw tails of C into Lion to hide. Work as for Mane around tip of Tail. Weave yarn ends through beg ring. Stuff Front Legs and sew to Body. Sew Back Legs to Body. Sew Ears to Head. Sew Tail to lower back of Body. With B, embroider straight stitch whiskers and claws. Weave in ends. 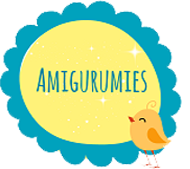 Gracias por el patrón, muy lindo tu blog.